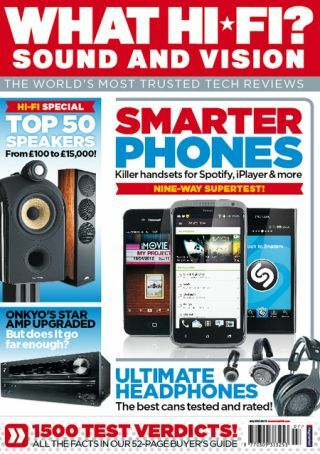 July issue on sale today, in print and online | What Hi-Fi? Our July issue is on sale today, both in print and online, and features our first Supertest of smartphones, plus an 18-page 'Hi-Fi Special' featuring our top 50 speakers from £100 to £15.000. We've picked our favourite speakers for a whole host of uses, from best laptop models to the ideal first hi-fi upgrade, best budget floorstanders, best wireless speakers, best on-wall design, great small standmounrters and many, many more. So whatever your needs or budget, we've picked the ideal speakers for you. Elsewhere in the issue we get to grips with nine of the latest iOS, Android and Windows smartphones which are now your interface with a whole world of content. Apple, HTC, LG, Nokia, Panasonic, Samsung and Sony go head to head. Of course no new issue would be complete without a smorgasbord of First Tests. This month we've been testing the Onkyo TX-NR515 AV receiver, Cyrus 8 DAC, Panasonic DMP-BDT500 Blu-ray player, Samsung UE40ES6800 smart TV, Musical Fidelity M1 DAC, Sony KDL-55HX853 LCD telly, Panasonic TX-P50VT50 plasma and Bang & Olufsen's Beolit 12 wireless dock – among other things. The extraordinary rise of Samsung as a serious challenger to Apple is the subject of our Insider section, and if you're in the market for a pair of upmarket headphones we've taken a long, hard listen to models from Beyerdynamic, Grado, Sennheiser and Shure. And don't forget you could win a pair of Grado PS500 headphones worth £700 in our online competition – we've got six pairs to give away. This month's Temptation subjects are an extraordinary £8000 DAC, the dCS Debussy, plus the first 4K2K projector we've seen, Sony's awesome VPL-VW1000ES. All this and more is packed into the July issue, out now. You can buy it in the shops or download the digital edition from iTunes or Zinio.